No. United Way of Central Missouri has never provided funding for any agency which performs abortions or provides counseling on abortions. United Way of Central Missouri does not refer individuals to abortion as an option. What is United Way of Central Missouri? United Way of Central Missouri is our community in action. We help people by fighting for the health, education, financial stability and basic needs of every person in our community. For over 90 years, the United Way has mobilized resources and leadership to help build a stronger community. United Way works together with individuals, businesses and organizations to build relationships, gather and share information, identify the most important issues and act on their root causes. This work requires a variety of action steps: conducting research, raising money, helping agencies focus their efforts and encouraging everyone to get involved. United Way of Central Missouri is focused on helping every person in our community live their best possible lives. Investing in our community through United Way makes sense. United Way of Central Missouri takes your contribution seriously. Through your annual contribution to the United Way campaign, you touch the lives of one out of two people in Mid-Missouri; a friend, a co-worker, a family member. The impact of your gift is multiplied hundreds of times over to prepare our children and youth for future success, to help people achieve financial stability leading to long-term independence, to enhance the health and safety of all our citizens and to be sure we can help our neighbors in crisis. United Way of Central Missouri uses your dollars, and your time and talents, purposely to implement strategies and achieve results right here at home, every day, all year long. How is United Way accountable? The United Way of Central Missouri strives to achieve excellence in all we do. Our volunteer board of directors is responsible for defining our vision and ensuring results. Integrity is the foundation of our value system. Volunteers review each agency allocation and approve them before a fundraising goal is set. Finally, outside auditors confirm the integrity of our internal operations and controls with an annual financial audit. But I already give to a charity, isn't that enough? We all have organizations and groups we support as individuals to make a difference. But there is some work we can only do together--as a community. When you give through United Way, together we improve more lives in more ways than any single agency can. One donation helps 28 local agencies, programs, and initiatives. By giving to United Way of Central Missouri, you become part of a caring community, committed to action. Why should I give if I never use agency services? The health, happiness and well-being of everyone in the community directly influences the quality of your life. United Way supported programs are community services, available to everyone. Illness, family problems, mental disorders and natural disasters know no economic boundaries. Members of your family, friends or neighbors may not need United Way services now, but may in the future. It is also comforting to know that United Way is at work to eliminate situations that are at the root of many issues. 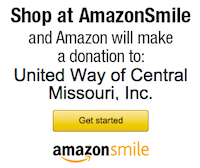 A gift to the United Way is a clear expression of your concern for central Missouri citizens. Chances are, you, or someone you know, has used services provided by United Way funding. Can I designate my money to a specific agency? One of the advantages of giving through United Way is the time and effort United Way and community volunteers devote to understanding what the important issues are, what is causing these issues to occur and what strategies can make the most lasting and impactful changes. We also know there are agencies that may be important to you. Therefore, if you choose, you may designate to a partner agency as listed under “Agency Partners”. What if I prefer to give my donation to one of the partner agencies? Why should I switch to United Way? One donation helps 28 local agencies, programs, and initiatives. Your donation stays at home in our community—helping local people. You can visit the partner agencies and see your donation at work helping people. If your company has a matching gift program, your gift can be multiplied. United Way provides a convenient service of payroll deduction--allowing you to possibly contribute more than you might be able to with a one-time gift. For many of millions of hard working individuals and families, the basic ingredients for a good life are increasingly beyond reach. Economic climate has been termed "the perfect storm". Local agencies are reporting that requests for assistance are outpacing available resources. That's why your participation and support of this year's campaign is critical. Help is needed now more than ever. Your gift will be helping your friends, family, neighbors and co-workers survive these difficult times. Every little bit helps and whatever you give matters and is appreciated. We also understand that giving financially may not be an option for everyone. We encourage people to get involved how it works best for them--whether that is giving, advocating or volunteering. How much of my donation goes to services versus operating cost? According to the National Charity Information Bureau, the national average for acceptable fund-raising costs is 40 cents for every dollar raised. Our United Way has consistently kept overhead costs under 10 percent--resulting in approxiately 90% of dollars raised going back into services. Less than ten cents of every dollar raised by the United Way is spent on fundraising and year-round monitoring of member agencies to ensure that your contributions are going back into the community to address critical issues and concerns. If I currently give through payroll deduction, do I have to fill out another form? Yes. You need to complete a new form confirming your pledge amount and your contact information each year. How do I receive documentation of my gift for tax deduction? United Way and all non-profit organizations are required to provide receipts for one-time gifts of $250 or higher if the gift is made by check or cash. This process excludes payroll deduction gifts because the donor's pay stub and pledge card will satisfy the IRS regulations for claiming charitable gifts by payroll deduction. If you have further questions, please contact our Finance Manager, Tonya Willig at 573-636-4100.
Who runs the United Way? United Way of Central Missouri is led by a paid staff of six individuals and hundreds of experienced volunteers whom are knowledgeable of our community’s special needs and dedicated to moving our community forward. A 24-member Board of Directors sets policy and makes decisions, ensuring that local contributions are put to the best possible use and the United Way continues to be accountable and transparent to our contributors and supporters. Who benefits from United Way services? Last year, over 86,000 Mid-Missouri residents benefitted from agencies or programs supported by the United Way. These agencies provide programs available to anyone who lives or works in Mid-Missouri. Why is the United Way so efficient and effective? The United Way of Central Missouri helps support 28 member agencies and programs.  Each agency is a volunteer-run, tax exempt, not-for-profit organization. 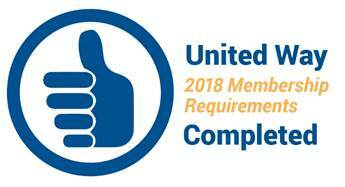 Through the umbrella support of the United Way, these agencies share a pool of organizational resources which lets them concentrate on the unique and special services they offer. The United Way of Central Missouri is local, accountable and responsive to the community.